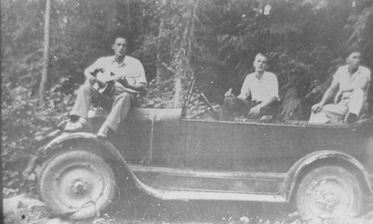 Les, Frank and Harold Tallmadge pose on the automobile that took them everywhere they wanted to go from their Bull River home in Lincoln, County, Montana. Courtesy Harry and Sarah Tallmadge collection. Mrs. Baxter sold land between her Baxter Hotel and Henry and Bob Larson's store to C. H. Norton, of Thompson Falls on May 3, 1921.1. Mr. Norton was an old man, tall, curly haired, and a penny pincher who was very frugal, and the other businessmen consider him an odd fellow. Prohibition had ended the saloon businesses. Ethel Fulks Greer had turned Finnigan's Saloon into a cafe. Don Maynard's building had become a meat market. Lumberjacks had nowhere to go for entertainment. The only place to dance was the upper story of Larson's store. For lack of adequate meeting places, the social life of the town was wanting. 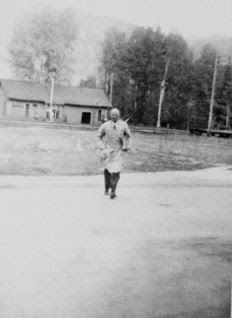 Old Man Norton owned a large building in Thompson Falls. The building at one time was a moving picture hall and a skating rink in Thompson Falls. 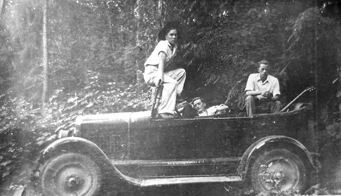 Norton dismantled the building, board by board, and hauled it all down to Noxon on a little Model T truck.2. "He started in the spring and worked all summer and by fall, early fall, he had the foundation set and the floor laid, almost abutting the west wall of Larson's Mercantile. Norton rebuilt his building board by board."3. "Norton spent a week straightening nails. They were only worth $4.00 a 100 lbs," Clifford Weare said. Norton was buying something at the People's Store. I give him back his change, nickels, you know. Pennies were new here then. We hadn't had them very long. So it was a couple cents more than what was due. "Well, now, wait a minute. I believe I got some pennies," he said. "Never mind, that's good enough anyway, I said. 'Well, you better have 'em. You know pennies makes dimes and dimes makes dollars', Norton answered. And that was the way he was. Nobody liked him, you know."4. "I was down there day after day when they was building that thing," Fred Minear said. "And Pearl and the two boys. We watched."5. "The front of the building was just a couple of rooms on the front where you went in the entrance door. But he put a railing around it and bought a Kohler light plant and had it out behind in a shed. He held dances there. The place was all open except for the railing, and he had some electric lights strung around there. "The orchestra would set in the middle. Several orchestras, what they called Andrews Girls from Tuscor (Mother and three daughters that had saxophone, violin, drums and the piano); also orchestras came from Sandpoint and from Hope to play there. "That was quite a thing out there that first year that he had it, that outside dancing at night there. He finally got a roof on it and that winter," Bob Saint said.6. When the baseball tournament came to town everyone enjoyed dancing at Norton's 'Pavilion'.7. Norton kept pounding nails until he had the big building entirely closed in. Windows graced the front, with a couple small ones on each sidewall and only a few inches seperated the building from Larson's Store. "Norton also had the dance hall. The dance hall came clear up almost to the front windows. And then the back end of the building was more or less of a kitchen where they served lunches and stuff at the dances. "It was quite a large place when the Norton's had it. They just had a little room or two up on the front to one side where they lived, is all."8. "I remember the first winter. He had roller-skating there. There were quite a few of us kids around town and we had a lot of fun at that. It was something new around there. I'd never skated before in my life until I went there."9. "I can't say what he charged for roller skating. But it couldn't have been more than 10-15 cents to roller skate. Normally with us it was one day a week. Whether he ran it during the week I don't really know. He probably did during the evening. But we just skated on Saturdays. "No music. Just skated. Clamp on skates, papier-mâché wheels, I suppose. Hard rubber, maybe. Regular indoor skates. He was a funny guy. "The thing that eliminated the skating was when Goldie Fulks fell and broke her arm. Norton shut down the skating and we all hated her for years over it. Probably about 1926 or '27 that she fell and broke her arm. That eliminated the skating right then. Norton probably was looking for an excuse to close it because I don't think it was really a money-making set-up. There just wasn't anybody in Noxon."10. Sometime after 1925, Sheldon S. Brown leased or rented the Noxon Hotel from Mrs. Baxter and converted it to a pool hall and ice cream parlor. It was during prohibition and the saloon business was still illegal. Two doors separated use by women and children from the pool hall used by men only. Through the back door, they could enjoy the soda fountain. For a nickel, a delicious ice cream cone or bar of candy could be had. A barbershop was in the front part of the building. The poolroom, between the front room and the back room, had two pool tables in it and card games. Norman and Betty Larson collection. Brown was a big, bald headed man. A non-drinker, he chewed Red Man tobacco. He was not a Sunday school teacher but S. S. was nicknamed "Sunday School Brown" because he hauled people into church on Sundays. "S. S. drove his buggy, he and his wife in front, his daughters in the back. He'd take them up to the church and let them out. Then he'd drive the team back down town and tie them up and he went in the pool hall or saloon and played poker until time church was over. Then he'd go back home again."11. S. S. liked to play poker. He was good-natured with the kids. He shipped in his ice cream from Sandpoint, Idaho, via the railroad. Harry Skillicorn was the barber there for a time. Harry was a small, dark complexioned man with a glass eye. His parents were from the Isle of Man, in the British Isles. Sharing equal attraction for youngsters, his barber chair sat in the front part of the old hotel building. Harry was crippled. He'd been a jockey at one time and got busted up when he was racing horses. Fascinating stories intrigued all listeners as Harry snip, snip, snipped.12. Along about that time Norton decided Noxon would support the new "moving pictures". "Eventually Norton got the theatre going and he had the moving picture machine and equipment in a little house built up, hanging down from the rafters," Carmen Moore said. "It was all lined with asbestos board. He had hands on him as big as boxing gloves and he was very clumsy; a great big muscular man with big hands. He was just big all over for a man of his age. "He got these old films and he had to run the machine by hand, cranking it like a cream separator, sixty turns per minute. But the film was so old, and celluloid, and it would break. Then he'd have to stop and pull some pieces together and run a common pin through it and get it going again. "There was a little slide he'd slide in that said 'One Minute Please' on the screen. And if he didn't turn the lights on it was still dark in there."13. "Now he had a show house. He had pictures. He had a little popcorn machine and made popcorn that you could buy for a nickel. Couldn't have been over that. Nobody had more than a nickel in those days here. He had a store in the front end. Eggs. Butter. And some stock of candy. He always had popcorn.14. "The first movie I ever saw was there. It was a silent movie. I can't remember. Probably, the musician there at that time was Theda Van Cleve's mother, Evelyn Berray. I don't know. Maybe we didn't even have music. I can't remember."15. "I used to go to the shows. They cost 25 cents," Carmen Moore said. "He asked me one day, gee whiz I sure wish you'd help me with this film machine and run the pictures. I said sure. So we had to climb up there on a ladder. "I got the job of setting the carbons that formed the light from the light plant. The 'juice' ran in there and these carbons were like an arc welding machine, more or less, but it made a bright light and that's what lighted the screen. "I did that for a while and then he said, 'You try this other part of the machine and start cranking on it and run it.' "We'd run one reel out and then we'd have to stop and put in the 'One Minute Please' slide while we'd rewind the film, put it back in the box, and then put in a new reel. "We had the Hoop Gibson and cowboy pictures. We usually had cowboy pictures. It seemed like they were the cheapest films. Then he'd have a serial of 'Paradise Jungle', or something like that. It would be a one reeler so people would come the next week to see what happened to one of the people in the film who got lost in the jungle or something. "I don't remember this myself, but Bill (Finnigan) tells that I used to read the screen to Noxon's kids. "See, when we went to see the pictures, they weren't talking pictures. They were the kind where the words were up there project with the picture onto the screen. If you didn't read you just didn't know what was going on. So I used to read the pictures. I was in school and I could read. "So he says. I used to read them to him. He always sat by me in the movies ...[he'd] get right down on the front bench and I read it to him. I don't recall this, but I probably did. "We had a music teacher moved in town. She taught piano. Mrs. Younker."16. (Mary Easter Younker may have played the piano for the silent movies. Maybe Ann Larson or Mrs. Berray did. No one remembers for sure.) Norton ran the silent films "for a while but usually the film would break two or three times. And he'd have to give everybody their money back and then they'd have to come in again next week. It got to where he couldn't make anything at it so he eventually quit them."17. Dancing was the single constant entertainment in all of the communities. Families arrived with small children and babies, too. When the youngsters tired, their parents spread coats and blankets on the floor beside chairs lining the walls, where the children slept until the dance ended, usually around three o'clock in the morning. "The Charleston was coming in when I was about 11 years old and we all tried it, you know," Ruth McKay said. "They danced the fox trot but not a lot of square dancing. We wanted to keep up with the modern dancing. "When I was about 13 the Exchequer Boys from Thompson with Don Pearsall. Don worked on the railroad with Hub Tauscher. Hub was an engineer on the railroad. I don't know who played with Don Pearsall because at thirteen I had a big crush on Don. I'd sit right there by the drums, I simply watched the drummer. "Gene Dettwiler was one of my first boyfriends. He brought me over to his place once when we were just a bunch of kids. They had that (foot) bridge across the river there (at Cabinet, ID). Scary thing. "You knows these smart old boys, they got to get the girls screaming and all. And they got it swinging. His mother was very ill with cancer. They didn't hospitalize them. They just left them at home. We danced at Norton's, yeah that was a good place. Used to be a roller rink there and the dance hall and movies."18. When Clifford Weare managed the People's Commercial Store he and his family lived in the upstairs, where they had a good view of Main Street and the street in front of Peek's, where dances were held upstairs. "I never paid much attention to the dances. I always had so darned much else to do that I didn't have time to dance. And I was too tired to dance, anyway. Once, I was just asleep and I woke up and I heard the darnedest screaming and a hollering. And I wondered what in the world was the matter. And I run shoved the window up and looked out. "This Johnson and people were running in every direction out there. Bill Greer and this Johnson was fighting. And the women was trying to help. The dance was breaking up in the morning. There was the three Bauer girls, and I had a fella, Bobby Thomas, working for me [in a timber camp.] He was in [from camp.] He'd been dancing. "This Johnson, you wouldn't think he could fight. But he whipped Bill Greer all to beat the dickens. Somebody pulled him off. I seen Johnson the next day. But I never did see Bill Greer 'til he come back from Sunnyside, Washington (years later) and he had a wife and three girls with him."19. Ira B. 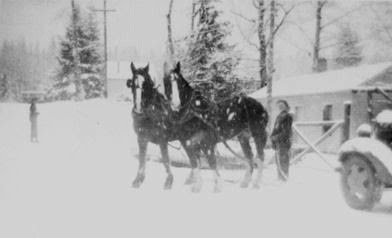 'Strawberry' Bartholomew loved his team of horses and used them long, long after the automobile and mechanized logging entered the valley. This photo is taken just east of Everett and John Jenkins Store on the Main Street of noxon. Courtesy Norman and Betty Larson collection. Weare recalled other dances and things that happened at them. "I knew Bedard. Bedard didn't like me. And he had a great big over-grown kid. About 18 years-old, or 20. Six foot and weighed 200 pounds. "They was having a dance there one time at Noxon. And we was there. I didn't dance. I was standing watching the rest of them dancing. And this kid come out. There was three or four of us there watching. "He said, 'Get outta the way if you ain't gonna go in and dance!' And he shoved an old man there. A man 45 or 50 years-old. And he give him a shove and he darned near shoved the old fella down. I guess he would, if I hadn't a caught him. "This Bedard kid, he went on out and had a drink of whiskey, I guess, and come back in. We was all standing there again. And he shoved this old man around again and this old man just come right from the ground and hit him and Bedard went down! "He was an old man, 45 years old. The Bedard kid got up. And he knocked him down three, four times. Bedard didn't want in no more. He went and got in his car and I never seen him since! He never come back. Hahaha. He went and got in his car and went home. They lived down at Clark's Fork, then. "This old man tickled me. This old man just hit him so hard. And just as he got on his feet he hit him again. And then he hit him three or four times. And the blood was just a flyin!"20. Ethel Bartholomew took over S. S. Brown's Pool Hall and Stawberry ran it for her later. Charlie Munson died of a heart attack there after Ethel and Strawberry took it.21. After leaving the pool hall, Skillicorn moved into a little building Ethel owned near the cafe she'd opened in the old Finnigan Saloon building. Margaret Larson Cluzen, letter January 21, 1970. Recorded deed #26948. May 3, 1921 Lena Baxter sold lot to C. H. Norton. 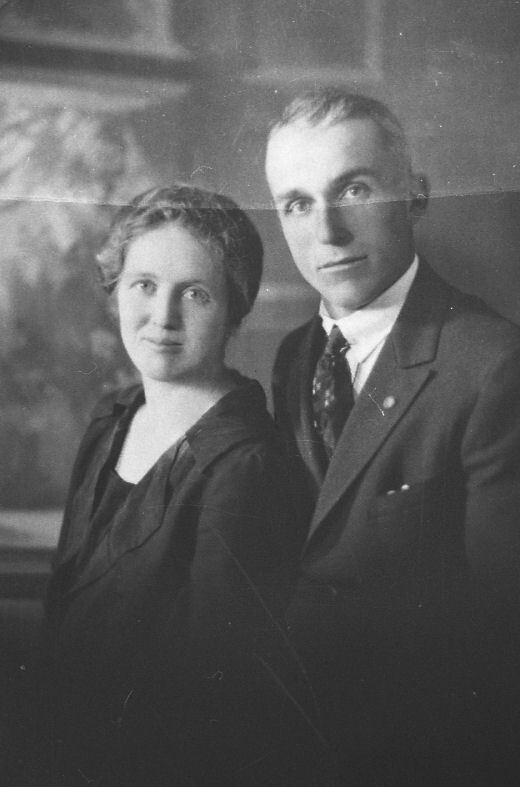 Marieneus "Marion" and Henry Larson bought Norton's November 21, 1928. Used as dancehall. Henry sold out to Marion January 16, 1935. Fred Minear, Carmen Moore, H. R. Bob Saint, tape-recorded oral history, var. Clifford R. Weare, tape-recorded oral history, var. Sanders County Independent Ledger, July 21, 1921. H. R. Bob Saint, tape-recorded oral history, November 18, 1983; Loren "Lanky" Jamison, tape-recorded oral history, var., Fred Minear, tape-recorded oral history February 1, 1990.